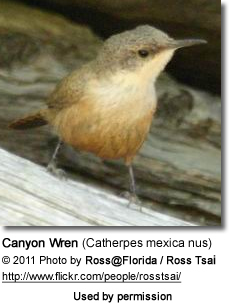 The Canyon Wren (Catherpes mexica nus) is a small inconspicuous North Americanwren. 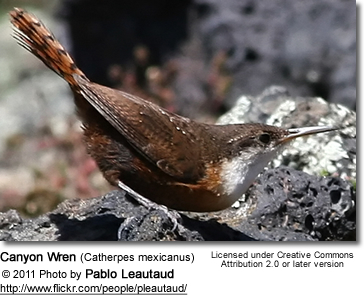 It is the only species in the genus Catherpes (monotypic). 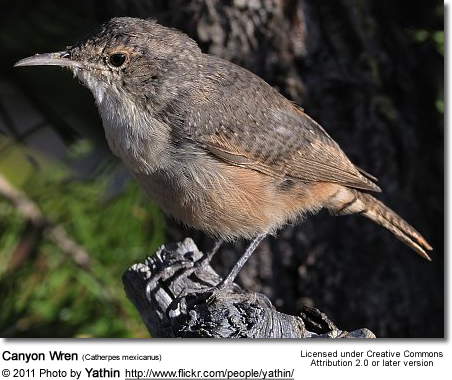 Juveniles: Look like adults, but their upperparts appear more textured and less spotted; and their flanks lack barring. 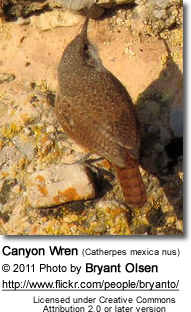 Similar Species: Its coloration is more of a rusty color than that of theRock Wren, with a contrasting white throat and darker underparts. 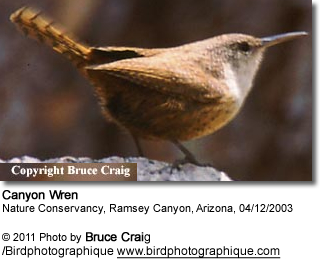 The Canyon Wren also has a longer bill. Its natural range stretches from far southern British Columbia and Montana south through much of Mexico and east to Oklahoma and Texas. 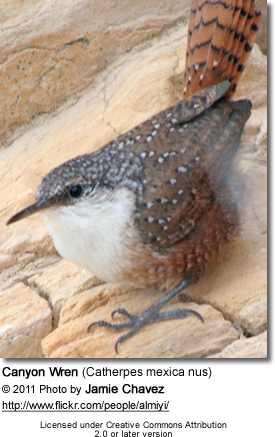 The Canyon Wren prefers rocky environments near water. Their preferred habits include canyons, cliffs, rocky outcrops and boulder piles. They inhabit the same territories year-round. 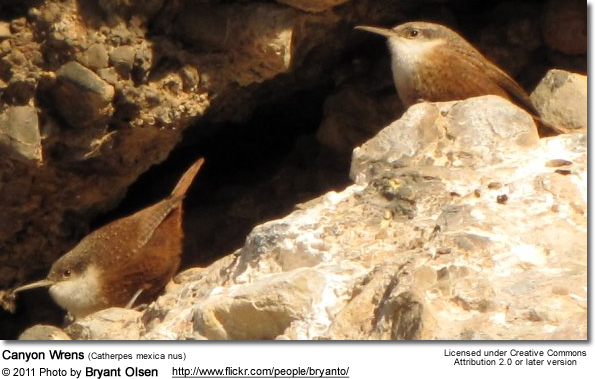 Although not generally associated with human development, the Canyon Wren do occur in villages in the southwestern United States and Mexico. 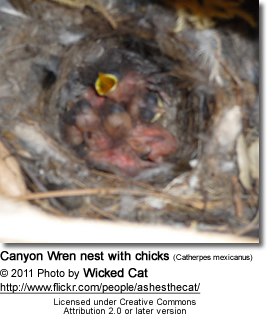 The Canyon Wrens are often seen creeping like mice around rocky mountainsides. They construct their shallow cup nest out of twigs, moss, plant down and other vegetation in sheltered rock crevices or old stone buildings. The hen lays 4 to 6 eggs (white with reddish brown and grey speckles). 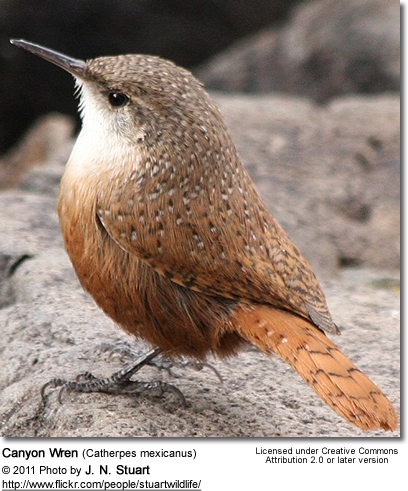 It feeds on insects and spiders by using its long, decurved bill and flattened head to probe for spiders and insects deep in rock crevices. They are often seen foraging along the sides of desert springs, but not drinking. One assumes that they obtain all the water they need from insect prey. This songbird is more often heard than seen, announcing its presence by its beautiful song - a cascade of musical whistles "peup, peup, peup tew tew tew tew tew mew", "jeet" . 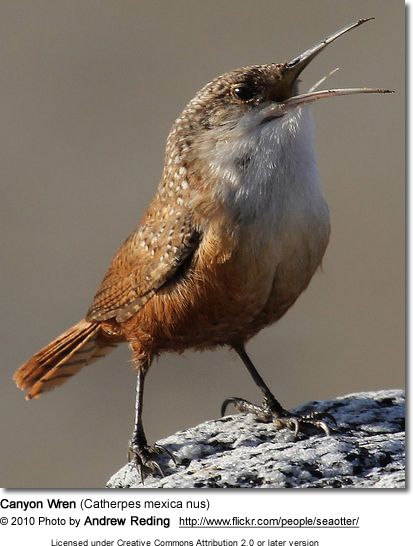 Its melodious song is often heard echoing throughout the canyons of western North America.